Adam Duggleby was born on 16th October 1984 in Beverley, East Yorkshire and joined his first cycling club aged 11. He started out competing aged 13 in Open Cycling Time Trial events. In 2001 he won the George Herbert Stancer Memorial 10 mile Time Trial (School Boys, age 16) and the Junior National 10 Mile Time Trial; he also won the Junior 10 mile Time Trial the following year. He was picked up by the Junior British National team to ride the team pursuit event along side Ed Clancy and Mark Cavendish and competed at a number of Junior World Cups. He felt that at the time the number of people succeeding to make a career out of cycling in the UK was not in his favour, so decided to focus on university education. He went on to get a degree in Mathematics and Accounting at Loughborough University. Adam raced seriously again after university and quickly regained his Elite British Cycling Licence. He completed in many of the Elite Road and Circuit race Calendar from 2009 and had a number of top 10 finishes. He did however seem to excel on the track, winning the Hard Track Endurance Series in 2012 along with the Golden Wheel International event on Good Friday. He completed 2012 season winning the 20km National Scratch Race, which is one of his best solo career results to date. 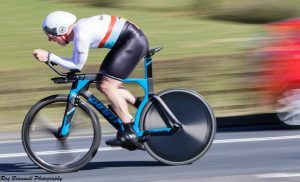 In 2017 Adam broke individual national time trial records for 10 miles on a Tricycle with 19min 30sec and 100 miles on a bicycle with 3hrs 16min 51sec. At the end of 2017 Adam was crowned CTT British Best All-Rounder, with an all time record average speed for his fastest 50 and 100 mile and furthest 12 hour ride of the year. 2018 he finished 1st in the CTT National 12 hour Time Trial Championship, his first ever Men’s CTT National solo medal. Later in the year he came 3rd in the CTT National 50 mile TT and 3rd in the National 100mile TT. In 2013 after a strong road and circuit race season he was asked to pilot Steve Bate, a visually impaired cyclist, who had great potential and by January 2014 they were riding for the British Cycling Development programme. Adam and Steve first raced in March of 2014 where they won the Dutch Tandem Tour, beating the current world champions. 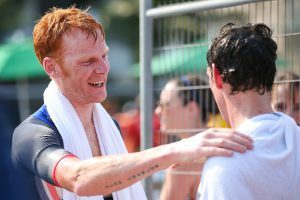 They went on to medal in Italy road world cup in 2015 in both the road race and time trial, then went on to win the Time Trial in South Africa in the August 2015 World Cup. During the Montichiari World Track Championships in March 2016 they sealed their place for the Paralympics by qualifying 3rd with 4.16.555 beating their own national record by over 5 seconds. Unfortunately they finished 4th in the final missing out on a medal by just over a second. 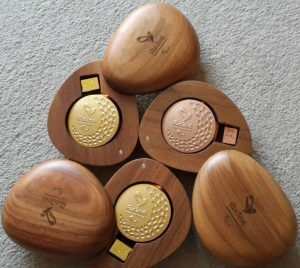 At the Rio Paralympics in 2016 they qualified fastest with in 4.08.146 and a new World Record. In the final they backed this up with 4.08.631 and won Paralympic gold by 1.6 seconds. Then they set their sights on the Time Trial, which was their main aim of the Paralympics, which they ended up winning by only 8sec over the 18mile course. This was their 2nd Gold medal in 6 days. The pair completed their Paralympic campaign by taking Bronze in the Road Race. Steve and Adam have since finished 2nd in the 2017 World Para Time Trial and became Para World Tandem 4km Pursuit Champions for the first time in 2018!